Zale waits for his opp. 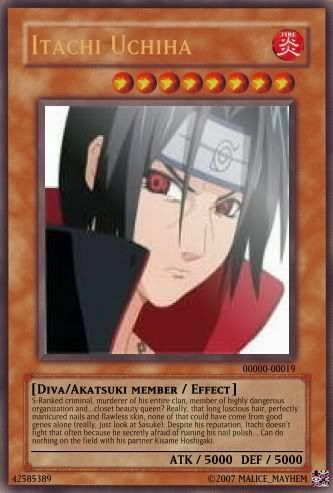 itachi shows up be hind zale. yeah i know the cenario. lower posts firsts? would you like me to go first? Ice Armor(200 Chakra) All attacks do half the damage but fire. Dance of the Seedling Ferns (400 Chakra) Multi-hit 600 Life Damage. Unavoidable. Once per battle. Inked dragon (250 chakra) 300 life damage. Once per battle. Unavoidable. Village Ninjutsu (Passive) All village ninjutsu does an extra 50 life damage. RasenShuriken (500 chakra) 1000 life damage. Completely Unavoidable. Once per battle. lol i loose but how u lvl 9? 3.So is when do you wanna do the GOD missions? MAD sorry LOL but ya you can move it up or ill give you a GOD mission so u can Lv. up if you want? ?